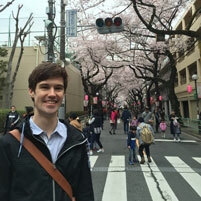 Kyle Troutner (SCS’14) has been fascinated with Japanese culture since childhood. “I thought the samurai and ninja were cool and wanted to learn more about Japan,” Troutner said. He started studying Japanese with a private teacher in sixth grade, and continued taking courses throughout high school. By the time Troutner arrived at Carnegie Mellon University, he already knew that he wanted to double major in computer science and Japanese Studies. Today, Troutner is a software engineer at Japanese e-commerce company Rakuten. Yasufumi Iwasaki, associate teaching professor of Japanese, advised Troutner and taught many of his language courses. Troutner is not alone in combining language expertise with another discipline. In our increasingly globalized world, foreign language education is becoming more critical. Thankfully, CMU students have the Dietrich College of Humanities and Social Sciences’ Department of Modern Languages. And they are taking advantage of it. Despite no university-wide language requirement, in 2014, 45 percent of CMU students from across the university took a modern languages course. This is a striking contrast to the roughly eight percent of undergraduates nationally who take a foreign language class. Catherine Rodríguez (DC’12, A’12) credits CMU with helping her synthesize her passions. As a freshman, she discovered the field of dramaturgy, which combined her interests in writing, editing and theater. The following year, Rodríguez’s personal life took center stage when her grandfather passed away. To reconnect with her Nicaraguan roots and honor her “abuelito,” she declared a major in Hispanic Studies. “Language was a big part of recovering,” said Rodríguez. She gained a deeper understanding of her heritage by studying the intersections of African-American history, colonial studies and Hispanic Studies, which spanned a broad range of Spanish-speaking countries. “Latin America is huge — not a monolith. Yet there was a spirit that I felt connected to,” said Rodríguez. Kenya Dworkin y Méndez, associate professor of Hispanic Studies, taught Rodríguez in her Spanish-language U.S. Latinos class. “She was eager to enter into historical and ethical discussions regarding the history and position of Latinos in the U.S.,” Dworkin y Méndez said. Throughout her career, Rodríguez has blended Hispanic Studies and dramaturgy as a producer, translator, dramaturg and advocate for the Latinx theater community. Today, she is a rising second-year MFA candidate in Dramaturgy and Dramatic Criticism at Yale. “More than a job description or title, I want to be part of the national conversation, I want to help frame that conversation, I want to occupy space and make space for others. I don’t know what that job is — it may be something I’ve never heard of —but I see myself as a leader,” said Rodríguez. Therese Tardio, associate teaching professor of Hispanic Studies, was Rodríguez’s adviser and remembers her drive to succeed. “She throws herself deeply into her work with a serious commitment and intellectual passion,” said Tardio. Learn more about the Department of Modern Languages.